Saccheen Laing is a young poet from Spanish Town, Jamaica. She currently has four poetry books to date and has recently released the acclaimed children’s book the Curly Hair Club. Saccheen’s work has caught the eyes of famous faces such as Nick Cannon and Rosario Dawson who have showed their love for her poetry on their social media platforms. As a young black woman she has used her love for poetry to empower and promote love for her fellow black queens. She also ensures that she shares motivational and inspirational content on a daily basis. Saccheen works under own banner of, “Stimulation of the mind, one word at a time.” She hopes that readers will find comfort through her pieces and receive that extra assurance that they may lack to keep moving towards their dreams. Saccheen started writing poetry as soon as she was able to read. For her, poetry was her first friend and still remains as her best friend. She encourages people to be proud of their individuality and not give in to the urge to conform to practices that take them away from who they really are. 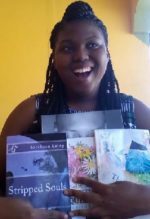 Her poetry books are: The Voice of Jamaica, Stripped Souls, The Poet’s Escape and Poetic Queens.